We are glad you are here and ready for an adventure. We want to come alongside you on that adventure. There are many ways you can connect to Cru. First, you will find us leading one of the Plebe summer Sunday seminars immediately following the 0900 protestant service in All Faiths Chapel. 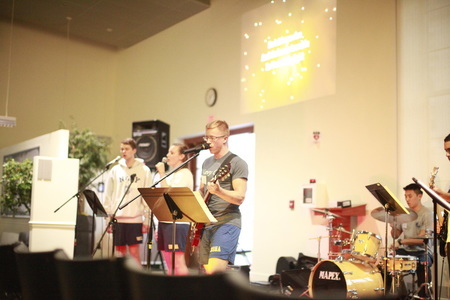 Once the year academic year begins you can connect to Cru throughout the week. The first place to find us is every Tuesday at 1900 in the Laboon center. We affectionately call this meeting Cru! It's a great place to get connected and explore who God is and what He has to do with your life. We have music, teaching, food, friendship and a whole lot of fun. If you are looking for a smaller group another place to connect is in our Bible Studies. Our Small Group Bible Studies are the primary way for you to go deeper and build relationships. We have a large variety of studies. Hopefully you can find something that will fit you. The studies meet on Thursday nights at 1900 in Laboon and All Faiths. Hope to see you there. There are may more ways you can connect, explore this site and see what we offer, sign up for our weekly email announcements (you can always unsubscribe), fill out an interest survey, or send a question to one of our staff. If you want to go to church out in town, you will first need to fill out a Chit to leave the yard on Sundays. Here is a sample. Guy leader info coming soon.